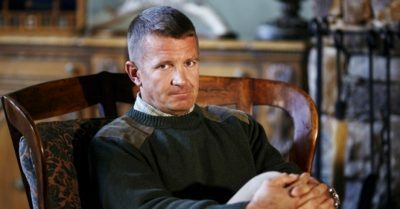 Sworn statements filed in Federal Court allege that Blackwater founder Erik Prince launched a “crusade” to eliminate Muslims and Islam. In their testimony, both men also allege that Blackwater was smuggling weapons into Iraq. One of the men alleges that Prince turned a profit by transporting “illegal” or “unlawful” weapons into the country on Prince’s private planes. They also charge that Prince and other Blackwater executives destroyed incriminating videos, emails and other documents and have intentionally deceived the US State Department and other federal agencies. The identities of the two individuals were sealed out of concerns for their safety. These allegations, and a series of other charges, are contained in sworn affidavits, given under penalty of perjury, filed late at night on August 3 in the Eastern District of Virginia as part of a seventy-page motion by lawyers for Iraqi civilians suing Blackwater for alleged war crimes and other misconduct. Susan Burke, a private attorney working in conjunction with the Center for Constitutional Rights, is suing Blackwater in five separate civil cases filed in the Washington, DC, area. They were recently consolidated before Judge T.S. Ellis III of the Eastern District of Virginia for pretrial motions. Burke filed the August 3 motion in response to Blackwater’s motion to dismiss the case. Blackwater asserts that Prince and the company are innocent of any wrongdoing and that they were professionally performing their duties on behalf of their employer, the US State Department. Jeremy Scahill, a Puffin Foundation Writing Fellow at The Nation Institute, is the author of the bestselling Blackwater: The Rise of the World’s Most Powerful Mercenary Army, published by Nation Books. Nation Books will release Scahill’s second book, Dirty Wars: The World Is a Battlefield, in April 2013. He is the writer, with David Riker, and a producer of the documentary feature film, Dirty Wars, which will be released by IFC Films throughout North America in June 2013. You can read his blog on TheNation.com here.